This project was born out of one person's frustrations in finding a decent new car. 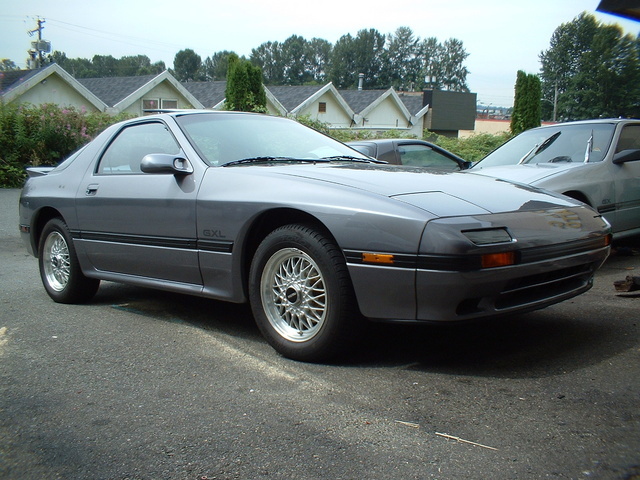 After having purchased a Mazdaspeed Protege and being thoroughly dissapointed with it he decided to restore this 1988 Mazda RX-7 from the ground up. It will be stripped down completely, painted Titanium Gray to match his Miata and Protege. A new engine, transmission, suspension, and brakes will be installed. And it will be given a black interior to replace the red one the car came with. The car has rust on it but before it went to the body shop it was stripped down completely so that it could also be painted at the same time. The interior was moldy so it was mostly ripped out and the engine was no good so it was removed to be used as a core. With the engine and all the accessories out of the way the engine bay was painted black before loading the car onto a flatbed truck. It was at the body shop for a long time due to the rust, the dents, the dings, the sanding, the priming, and the painting. After it was painted it was trucked back here where the long re-assembly could begin. The bumpers got masked to have the belt line painted black as new pieces were brought in for the doors. The carpet and stereo wiring went in next, it was given a full Alpine stereo, amp, speakers, as well as connections for a subwoofer and iPod. Once the wiring was done and the carpet was cut and trimmed, the heater, vent tubes, and dash were re-installed. At this point the interior is as done as it can be, the seats and door panels were sent out to be re-upholstered in leather. Now the attention was put towards getting the engine back in and all the accessories that go with it. A stock rebuilt 13B was installed along with a brand new, not rebuilt, but new, transmission. Exhaust is handled by a combination of stock exhaust manifold, Bonez cat, and Racing Beat cat-back systems. The suspension was given new KYB shocks and new Mazda springs, and the brakes were given a 5 bolt conversion from one of the many RX-7 donor cars that contributed parts to this project. It rolls on factory BBS wheels, from a convertible, with Falken Ziex ZE-512 tires. The seats and door panels came back looking better than ever, so now with the interior complete it's time to turn our attention to the finale. With the suspension and brakes taken care of, and the drivetrain all in place, it's time to prepare for starting the car. All the belts are double checked, all the fluids topped up, all vacuum lines are checked, and everything is plugged in. After priming the motor and checking for fuel and spark, the big moment came. Would it fire right up, or would it sputter and die? The answer: it fired right up and ran like a champ.